techniques create the ultimate tea house experience. An assortment of dramatic and impactful lighting pieces were required for Yauatcha’s large, theatrical tea house in Broadgate Circle. In total, we were commissioned to create four types of bespoke lighting feature – each with its own unique style, in keeping with the oriental aesthetic. We created three large white silk pendants to be placed above the concierge desk and form a focal point for diners entering the restaurant. The underside of each pendant contains a spotlight, while an LED is housed in the interior to create a warm, illuminating glow. Clusters of tube-shaped bone china pendants hang over the dining area – each coated in a ceramic glaze to produce a stunning quality of translucency. We placed an LED at the top of each pendant, which provides a punch of direct light onto tables. To further emphasise the welcoming ambience of the restaurant, we integrated small, mirror-backed brass crosses into the brick walls and placed LEDs within each one. The LEDs give the appearance of a moving candle flame, creating an effect that’s subtle but beautiful. Our final bespoke creation are the red lantern pendants that hang above the kitchen pass and retail unit. They consist of bronze frames with a black wood trim, wrapped in exquisite French Veraseta silk. 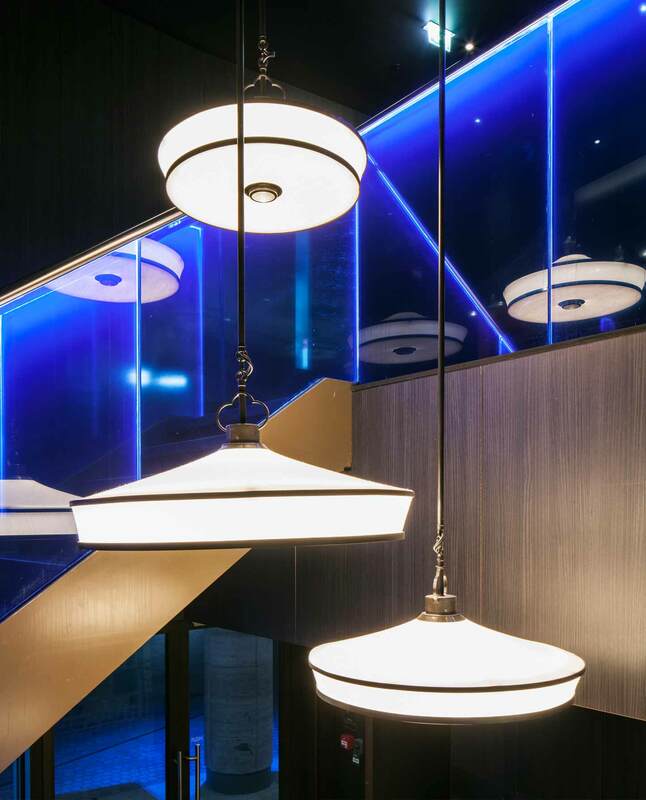 LEDs were placed inside the pendants for an internal glow, while LED downlights were added to the underside.